James Cottage, 77 Burrell Street, Crieff, Perthshire PH7 4DG. James Cottage is located within an hour’s drive of Glasgow & Edinburgh. From Edinburgh: Take the M9 junction 11 near Stirling and then follow on to the A9 north towards Perth. Stay on the A9 for about 5 miles and turn off at Greenloading on the A822 [brown tourist sign for Pitlochry] via Braco and Muthill and follow the signs for Crieff. On the approach to Crieff you cross a narrow stone bridge over the River Earn and James Cottage is the first B&B you approach as you turn into Burrell Street. From Glasgow: Take the M80 which joins the M9 just before Stirling, then the A9 turning off at Greenloaning on to the A822 tourist route to Pitlochy via Braco, Muthill and on to Crieff. On the approach to Crieff you cross a narrow stone bridge over the River Earn and James Cottage is the first B&B you approach as you turn into Burrell Street. Tariff: From £34 per person/per night sharing. A single room occupancy supplement also applies. 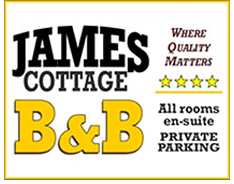 Parking is available in a private off-road car park to the rear of James Cottage. If cancelled up to 7 days before date of arrival, no further fee will apply but all deposits are non-refundable. If cancelled or modified later, 75 percent of the total price of the reservation will be charged. In case of no-show, the total price of the reservation will be charged.